Dan Loewenherz was sitting up one night with fiance and his mom, trying to conjure up a guy to set up with his fiance’s sister. They finally came up with the perfect guy, enthusiastically checked the guy’s Facebook profile and to much disappointment, saw that he was in a relationship. I know this has happened to you: You meet a great guy or girl, immediately run to Facebook or Google to Internet stalk them and find out that they’re spoken for. Boo. Well, Lowenherz put his programming skills to good use, and spent four hours that night creating the Breakup Notifier, which, similar to Break Up Alert, eliminates the Carpal Tunnel involved with constantly refreshing the object of your affection’s Facebook page for news about their sexual availability. Breakup Notifier is great for when you don’t actually talk to the person you want to hook up with because you’re a big nerd. The app now crawls Facebook every ten minutes, so you get up to the minute coverage of other people’s relationship misfortunes and can jump in while they’re still vulnerable. It’s called a rebound for a reason. 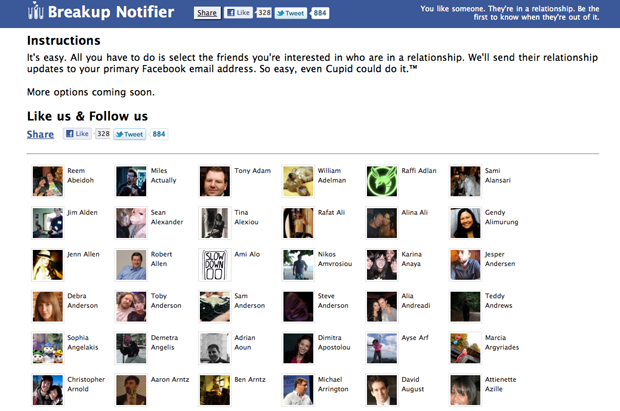 In the same vein, Lowenhertz has purchased unfriendnotifier.com and areweenemiesyet.com to set up un-friending notifications as well, which are a bit more challenging. He’s thinking of charging something like 99 cents for early adopters and then bumping the price up to $4.99 sometime afterwards. So get in while it’s cheap/free! And if this planned subscription model doesn’t pan out, Lowenherz should totally set up a freemium deal and have hot guys or girls “Poking” and “Liking” stuff on the target’s profile, you know, to help speed up the breakup.